The reserve is located at the top of the Grehan Valley above Akaroa, wrapping over the ridgeline to the Otanerito Valley and including several prominent peaks. It is directly uphill from the more urban part of Akaroa. 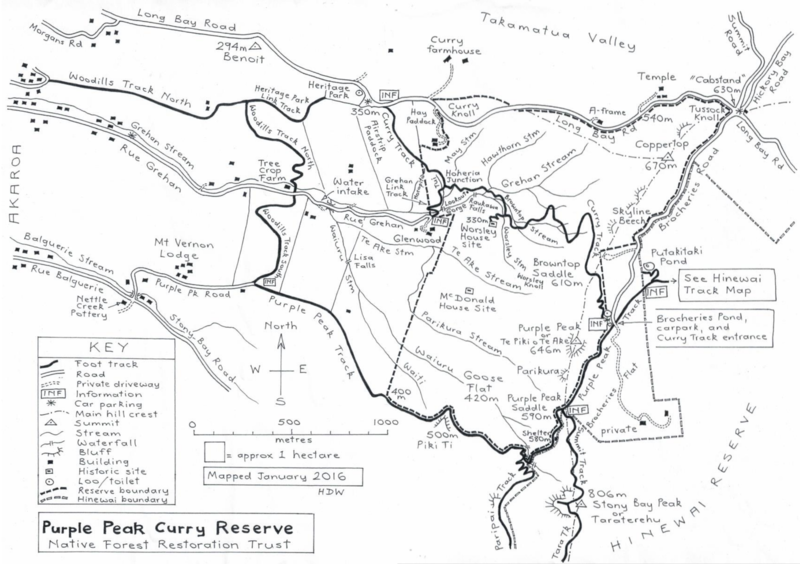 Purple Peak Curry Reserve is a 190 hectare conservation area near Akaroa, Banks Peninsula. It safeguards most of the catchment of Grehan Stream which contributes to Akaroa’s town water supply. The land was purchased from the Curry family in 2015 with substantial backing from Christchurch City Council and the Rod Donald Banks Peninsula Trust. 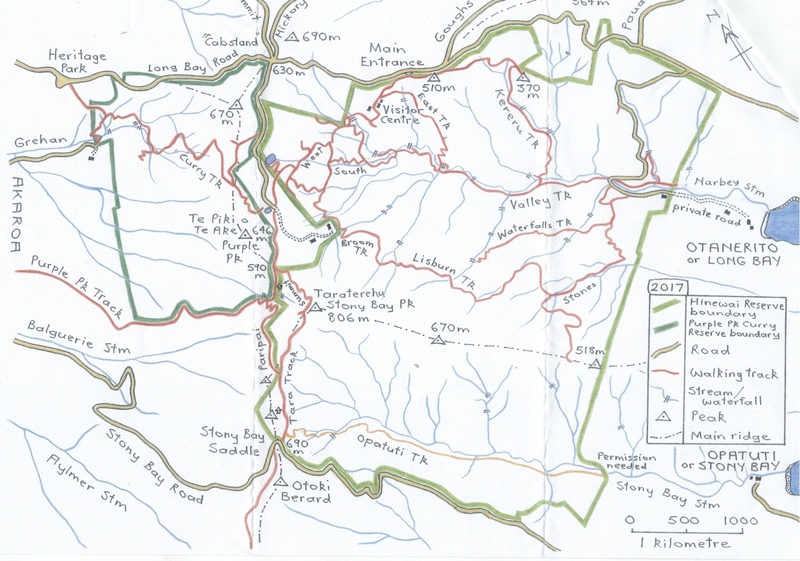 It is managed by the Maurice White Native Forest Trust which owns the adjacent Hinewai Reserve. The Curry family settled here in the 1870s and continues to farm nearby. The reserve takes in a 2 km stretch of the high skyline behind Akaroa, part of the eroded crater rim of Akaroa Volcano which was erupting from about 9 million to 8 million years ago. Amphitheatre-like, the Grehan catchment is backed by this steep crest of hills. As well as intimate forest interiors, the reserve offers magnificent vistas across harbour, hills, the distant Alps and the open ocean. Sheep and cattle were removed from the new reserve in 2015. The land is a mosaic of rough pasture, gorse scrub and native forest in various stages of development. The tall forest which clothed the landscape until the late 1800s is represented by a few surviving old tōtara, mataī and kahikatea and by one small stand of red beech. Some of the commonest smaller native trees are kānuka, fuchsia, māhoe, fivefinger, kōwhai, lacebark, ribbonwood, ngaio, kaikōmako, lemonwood, wineberry, pigeonwood and cabbage tree. Raukawa, one of the Peninsula’s rarest trees, grows on the reserve. There are three species of tree fern. Snow tussocks occupy some tiny areas of high open ground. Extensive areas of gorse serve as excellent nurse canopies for regenerating native trees. Some exotic trees are targeted for elimination, however, because they hinder native forest regeneration. Many native birds can be heard and seen: bellbird, tūī, brown creeper, tomtit, kererū, grey warbler, fantail, silvereye, rifleman, morepork, harrier, falcon, shining cuckoo (in season), kingfisher, black-backed gull, paradise shelduck, pipit, welcome swallow and spur-winged plover. Introduced birds are also common, especially redpoll, chaffinch, yellowhammer, greenfinch, goldfinch, blackbird, song thrush, starling, house sparrow, dunnock, California quail, rock pigeon, mallard, little owl, Australian magpie, skylark and feral goose. Introduced mammals you might see, such as hares, rabbits, possums, hedgehogs and stoats, are all undesirable aliens. Several species of gecko and skink live on the reserve. Streams and pools are home to native eels, bullies and galaxies, Australian whistling frogs, and native insect larvae. Among a richly diverse insect and spider fauna, a few colourful butterflies are conspicuous, especially red admirals, coppers and little blues. Little white ‘tents’ on shrubs belong to native nursery web spiders. Curry Track is the main walking route through the reserve. it links with Woodills Track, Akaroa Heritage Park on Long Bay Road, Rue Grehan, Brocheries Road, Hinewai’s extensive track network and an alternative decent to Akaroa via Purple Peak Track. People using the entrance from the top end of Rue Grehan are best to leave vehicles in Akaroa and walk up the road, which is narrow; watch out for local’s cars. There is almost nowhere to park or even turn a vehicle further up. Alternatively walk up Woodills Track North to the Heritage Park start of Curry Track. Toilets are provided at both ends of Curry Track. Worsley Historical Site – Frank Worsley was Ernest Shackleton’s famous Antarctic navigator in the early 20th Century. Frank was born in Akaroa in 1872 and spent part of his childhood in the upper Grehan Valley where his father Henry built a small housed cleared forest from the family’s 20 hectare holding, now part of the reserve.